It was a refreshingly different style of crossover that was presented by The Translators last night at Hippo, and perhaps apt following the weekend of the National Folk Festival. From my JazzGroove emails, it seems there’s a good deal of experimentation with different musical forms coming out of Sydney. Canberra seems to be relatively tame in this regard. I can guess two reasons for this. Firstly, our jazz players are mostly at the student level and are learning their trade; our best tend to leave for bigger smokes before they spread their exploratory wings. Secondly, when you’re in business and earning your crust, you are busy testing new ideas and sounds to see what sells, and that’s another prod for invention. Musical invention in Sydney features several Canberra names (Hauptmann, Undy, Clarke, Dewhurst, Ryan). It’s nice when those names come home for a family visit, as two of them did for the Translators gig. The Translators had elements common to other jazz formats mixed with tonalities which were decided different. There was Steve’s virtuoso, Gatling, punchy, Pastorial electric bass. Steve’s a stunner with some blisteringly fast but clear fills and sustained 16th note finger play in the tradition of Jaco: world class and not one to miss. James accompanied him with strongly driving but unobtrussive drumming. His has a full and rolling drumming style, with solos which are comfortable within the groove while deceptively crossing rhythms and dissecting bars and beats. Joining this were the less common sounds: Damian’s flamenco guitar and Ben on mandolin. Mandolin? Well, it was perfectly satisfying mandolin for lovers of a hot guitar solos. Ben played plenty of very stylish guitar-like jazz solos but with the clipped, peaky sound of the mandolin. It was interesting and engaging, but also strangely comfortable for such an uncommon instrument . Damian’s guitar was much more diverse in style. He introduced several tunes with classic flamenco solos and flourishes, and his solos were similarly Spanish. Sadly, the finger picking and nylon-strung guitar didn’t cut through like the other instruments, so I missed detail in many of his solos, but my impression was of Al DiMeola with Paco Peña, or a jazzy take on Sky with John Williams. The music was all original. Each of the members penned at least one tune performed on the night. It was all built on strong beats, and the powerful rhythm section made it incessantly danceable, so again I thought of the folk crowd which loves to dance. I counted several triple time rhythms, although there was also 4/4 and at least one 7/4 on the night. I wondered if it was the rhythm that had got to the couple who were sweatily pashing off in the front row for a full set, but perhaps it was just youthful lust. Whatever, this was fascinating and refreshing and inventive. A very successful fusion of elements of flamenco, jazz and even rock. The name says it all: translation. Great stuff and recommended. The Translators are Steve Hunter (electric bass), Ben Hauptmann (electric mandolin), Damian Wright (acoustic guitar), James Hauptmann (drums). Trombone is having its place in the sun in small as well as large ensembles. But tuba remains a rare instrument, despite its outing when the Sam Young Quartet played last night at Hippo. Valdis Thomann (trombone, tuba) was the player who revived this big and impressive brass horn for us. His partners in the quartet were Sam Young (drums), Aron Lyon (guitar) and Gareth Hill (bass). And the quartet became a quintet when Miroslav Bukovsky joined in for later sets. The tuba was fun. Big and clumsy, with a deep and sweet brass sound. Valdis played it both as a rhythm instrument (at times in unison with the bass), and as a pretty slow solo instrument. Nice to hear (and very difficult not to see) but totally obscuring the player below the bell. But the night was more than tuba. The band started with John Scofield’s tight and simple tune, Cool. Then on to a range of originals by various band members. They varied in time and rhythm. There was 6/4; there was an occasional walk, but the bass lines were mostly syncopated and funked up. There was sharp and open and expressive drumming from Sam; good solid, ever-reliable bass lines from Gareth; dirty and distorted, middy electric guitar solos and some lovely airy soundscapes from Aron using wah and echo. Valdis pulled tuneful and fairly bluesy baritone sounds from the trombone, performing with real physical involvement. The tenor of the night changed somewhat when Miro joined in. The melodies obviously displayed richer harmonies, with that lovely sweet tonality of a brass front line. Miro’s solos were fast and challenging, and the band sounded just a bit harder and tighter and more intense. The tunes they played with Miro also seemed longer and more composed/arranged. For me, these were the highlight the of night. These were more worldly and meditative; I thought here of storytelling and even magic realism. A nice night of restrained volume and comforable, worldly music. It will be interesting to compare the performance in few weeks when they appear as the Gareth Hill Quartet at the Gods. Ben Marston commenced his Jazz Project for 2008 with a big band session in the Street Theatre on Sunday. Big bands present a high level of complexity in organisation and in presentation, so they are not too common, but they are blissful in tone and complexity. It’s doubly difficult and impressive when you are composing and arranging all the music, as Ben did. The concert was in two sets, with plenty of variation in harmony and tonality. The first set opened with a dissonant tune with a political theme: “Canberra does not say anything” was indignation at Canberra standing in for Parliament and Government in the media. The next two tunes also had a Canberra theme, but were more joyous and pleasant, picturing a Garema Street Parade and Canberra’s autumn weather. These three tunes comprised the Canberra Suite. I particularly liked the complex, moody piece that followed. “Accidental instigation” was apparently written for, and played by, Ben’s band of recent years, 12 Tone Family. This was controlled, composed, emotive music. The set ended with James switching to electric bass and a stronger groove for the rest of the concert. Theophanaic synchronicity was the last tune of the first set. I’m not sure what the tune represented (although Theophanous is a federal political name) but I remember it as sixteenth notes with plenty of soloing from trumpet and other. The groove continued in the second set, along with some recurring references: a searing comment on politics in Dance of Disillusionment, and a gentler reference to Canberra weather in December rains. There was a gentler Lament for music, with some expressive soloing by John Mackey. But the feature for me was another suite, the perfectly expressive, and suitably worldly, African Roadside suite. It was made up of three pictorial tunes which described a car journey in Rwanda: a red earth roundabout, an open road journey, and the obvious relief in relaxation on arrival. More impressions? Several pieces of written counterpoint; quite a few guitar solos from Lachlan, and leads and solos from Ben; an expressive solo from John Mackay; and some collective solos, one of two trombones, another of alto and baritone sax. The encore was a case of sublime to ridiculous. Ben has played many small band outings with this rhythm section at Trinity on Tuesday nights. Madonna’s Material girl has become a standard at these sessions. It forms a great little groove for a blow; Chris, Lachlan, James and Ben carried it off with humour and funky precision. Nice one. The event was well supported, with lots of family and friends, so it was one of those pleasant jazz events with an easy and intimate atmosphere. I doubt it was so easy for ArtSound who recorded the event. Theirs was a challenging job, with more mics in the mix than I’ve seen them use before, and two mixers on the go. Ben’s project returns to the Street Theatre on 15 Jun, 14 Sept and 7 Dec, all Sunday afternoons at the Street Theatre. Apparently the next concert will be broadcast nationally by ABC-FM. For once, the media can say Canberra and we can feel comfortable with the label. Ben will be pleased! The band comprised: Miroslav Bukovsky, Dan Mclean, Ben Marston (trumpets), Alistair Clarke, Valdis Thomann, Rob Lee, Dave Hicks (trombones), Adam Mathews, Andrew Pogson, John Mackey, Joe Lloyd, James LeFevre (saxes), Chris Thwaite (drums), James Luke (bass), Lachlan Coventry (guitar), Wayne Kelly (piano). Jamie Oehlers was back in Canberra last night with his Quartet. It’s the same band that played so impressively at Hippos a year or so back. And the music was similarly passionate and committed, which suited an audience of mainly appreciative students. Jamie is renowned as one of our best tenor players, having won a prize at Montreux Festival, and more recently, the 2007 Australian jazz artist of the year. I don’t much like prizes in art, but you have to be good to win and Jamie is. He’s fluid both in sound and body; mobile, complex, fast. His responses to harmonies are challenging and varying; his melodies are fleeting and embellished; his commitment intense. This is not music for the tame. Sam K seems more musically approachable and immediate at first sight. His solos articulate in a way that seems more obvious, and yet they too delve into constantly-changing dissonance, so perhaps the initial impression is just that: an impression. He was also blissful on solo piano at various times, with a Yamaha grand to confirm the tonal richness. Sam A and Ben are masters. I’ve heard them several times at Hippo. More recently, I was overwhelmed by their performances at Wangaratta as the support players for the guitar competition. They played all range of styles at the highest level, with aptness and capability, for both consistently impressive solos and reliable, propulsive support. They didn’t need to suffer contestants’ nerves and they were always warmed up, but this was challenging in other ways: constant variation, long playing, and great responsibility to the contestants, and they did them proud. Sam told me he’d been totally exhausted after the festival; I can imagine. On the night, they each played superbly. Comfortable walks and solid rhythms from Sam. He soloed on a Paul Williamson lullaby as the leader of a collective improvisation; expressive and integral rather than individual and out front. And my impression of Ben was similar. It was as if he just released solos and rhythms from the music, as if they were already there and just needed a cage door to be opened for freedom. The Quartet played two sets, each of 5 tunes and each lasting about 60 minutes with no wasted time for chatter. Tunes included several from Jamie himself, as well as one each from Tomas Stanko, Sam Rivers (Beatrice), Paul Williamson, Coltrane (Dear Lord), and Ellington (Caravan). Caravan was mightily re-visioned with new time structures. The students were all discussing it in the break. Dave Rodrugues’s count of 17/4 as 7-7-3 was accepted; the timing on the bridge was deceptive and not straight but noone had a count for that. Beatrice was malleable, flowing, smooth, and somewhat veiled in performance: not veiled by arrangement, but by rich modern substitutions and harmonic flights obscuring the underlying chords. The other tunes were as rich. The Paul Williamson tune and Coltrane’s Dear Lord were ethereal and beauteous. The Tomas Stanko piece, and Jamie’s final original, Replicator, were hot and alive with energy. And I guess a final impression is of dynamics; from delicate piano to stomping swing, it was there and under control. So, this was a challenging and rewarding performance for those who got there. Keep an eye out for more concerts at the ANU Band Room. 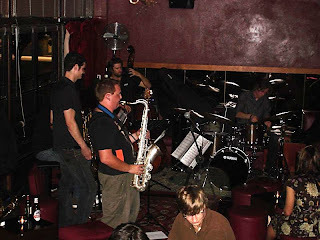 The Quartet comprised Jamie Oehlers (tenor sax), Sam Keevers (piano), Sam Anning (bass) and Ben Vanderwal (drums). As I had to catch the last and “relatively late” bus at 11:25pm I was unable to catch the third set of this gig – the time when a band usually breaks loose and you may even see a few loose dancers rise from the audience. The first two sets had a mixture of west coast and bebop styles, mostly originals. It is refreshing to hear a trombone as it can really bolster the depth of a small group and hint at a big band sound. Rob Lee’s trombone was restrained and inventive, adding another layer to the heads of tunes and a mellow contrast to Le Fevre’s more cerebral solos. Lee seemed fully in control and created good space and rhythmic freedom while exploring the trombone’s murky registers. James Le Fevre built up his solos nicely, both in an individual sense, and as the evening progressed. By the second set he was emitting some adventurous squeaks, squeals, anguished wails and grunts reminiscent of Dizzy Gillespie. Evan Dorrian did a good job backing Le Fevre’s syncopated melodies on drums. Most of the first two sets had driving straight-eights beats and Dorrian didn’t get distracted by Le Fevre’s intrepidity, managing some well timed flourishes. His drum solos had taste and tonal interest, with varying attacks and good use of the high-hat and side drums. He might have overused the drum-roll and could think about taking the beat further out during his solos. The bass was fine with Kane Watters swapping between an electric bass and what appeared to be a five string acoustic bass, although my eyes may have deceived me. The fusion nature of the music wasn’t suited to bass soloing so there weren’t many of these. Also, perhaps the electric bass was a touch too loud – it had a good clear percussive attack though. Ben Foster was cool and refined on keys, using mostly Hammond organ effects. I wouldn’t have minded an occasional use of piano but that could have destroyed the continuity of the electric ambience. My only wish to hear piano stems from being a bit of a jazz piano purist and wanting to see someone with Ben Foster’s skills show off his chops. The first piece had a decidedly Herbie Hancock feel with a funky bass and laid back organ flavourings. Later Foster made use of “wah-wah” synth effects, and, as the second set slowed pace, watery electric piano accompanied LeFevre’s musings. The second piece had interesting harmonic content as eastern scales were explored and blended with a jazz sensibility. The Coltrane influence is here: Le Fevre likes to achieve the dry sound, jagged scalar patterns and eastern influences of Coltrane’s later years. Apart from Hancock, that other doyen of electric jazz, Sun Ra, was also in evidence. One piece began with spacey, pulsating synth effects and the interplay between trombone and sax was well balanced during looser improvisations while maintaining tension. The audience enjoyed the evening. People of all ages jostled for sitting room while Canberra jazz school students such as drummer Mark Body and trombonist Sophie were in attendance. John Mackey arrived during the second set and watched appreciatively from the bar. James leads his band well – his quintet contains a promising group of growing local musicians. Despite the sad demise of White Eagle last year, 2008 is shaping up as a big year for jazz in Canberra. Hippo remains active on Wednesdays with plenty of overseas and interstate visitors. Geoff Page’s Jazz at the Gods series has 9 monthly concerts spread over the year. The Mace Francis Big Band from Perth is visiting in July and Ben Marston is running a series of big band concerts at the Street Theatre. The Street Theatre is also featuring the renowned NY sax/clarinetist Don Byron in May and has recently hosted the Necks. The Jazz School has three more concerts in the first semester, featuring Steve Magnussen from Melbourne, and the US sax player John Gordon. There will be more large ensembles at those concerts. The Moruya Festival (the Canberra jazz family get-together) is in October. For some, there are other festivals: Wangaratta, Merimbula, Wagga, Thredbo. There are several bars and clubs featuring jazz, so there’s something to listen to on most nights. The Julep Lounge in Manuka Seems to be following in the tracks of Hippo with the best local players on Thursday nights. 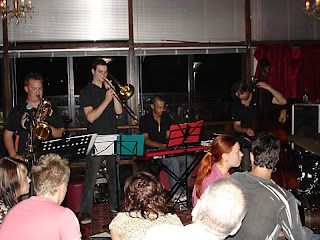 The Belgian Beer Cellar, the Kurrajong, the Casino, Trinity and others have regular jazz. And I fully expect to hear of more events during the year. I keep CJCalendar up-to-date with everything I hear about, so keep an eye on it. And if you know of any gigs that are missing from the calendar, please advise by email. If you are a budding music journalist or photographer, I’d be happy to hear from you and I’d welcome your input. It’s looking a busy year for me too, and I can’t get to it all. BTW, this is CJBlog’s 200th post. It was a perfect day for jazz in a beer garden. The beer was English ale on tap; the band was Funky Fedoras with Angela Lount out front and one of the hardest swinging, and most capable, back lines in town. I could only stay a short time, so I just heard the smooth dinner music set (for this, read standards and lounge) but they were lusciously performed, with Angela’s deep, rich rounded voice, rock steady swing, plenty of traded fours, and great solos from both Wayne and James. Wayne is always a great performer. This was a big change after hearing him as McCoy Tyner playing Love Supreme only days before, and it confirmed his versatility. This was chordal solos, octaves, block chords, and occasional modern interpolations. I was stunned by one passage that meandered off, sounding dangerously close to free, but fell back effortlessly to swing; lovely. James hinted at his spacious, funky Tuesday evening gigs at Trinity with fluent fretless solos, but this was more passing chords and cycles of fifths, rather than sparse, horizontal playing. But again, satisfying and comfortable. Chris had plenty of opportunities for swapping, and did that in his melodic, understated style. Angela’s rich, low pitched voice sat comfortably over this bubbling background with clear, sonorous vitality, and an easy stage presence. I can see why this is a busy corporate band around town. Angela told us that Jazz at the George was closing up for the season. Given it was such a perfect day, it was doubly sad to hear, but it will presumably be back with the Spring. The Autumn/Winter period in Canberra is chilly at times, and the jazz retreats indoors, so this is not unexpected. But sitting with a beer in my hand on a perfect day, it did seem a loss. The Funky Fedoras are Angela Lount (vocal), Wayne Kelly (piano), James Luke (bass) and Chris Thwaite (drums). John Mackey and his quartet inaugurated the Jazz at the Gods series for 2008 with a Coltrane memorial concert, featuring a full performance of Trane’s classic album, A Love Supreme. This band previously performed Love supreme at Hippo a few months back, and I raved about it here. This was a different performance. For me, it was more quiet and reflective (pretty much inevitable when you compare the two venues), a little less ecstatic but perhaps intellectually more satisfying. The segments of the piece seemed more obvious and defined; the playing generally more comfortable, and the audience less intrusive. John was playing a borrowed 1957 Selmer Mark VI which was in wonderful condition and sounded like chocolate butter, so he was quiet and thoughtful in reinterpreting his idol. This was engaging and satisfying playing, reenacting the solos and harmonies of Coltrane of the period. His authenticity was confirmed by the look of respect and glee on Jonathan’s face as he sat out. Wayne was a pleasure with fourth chords echoing the real McCoy, and generally an ease and fluency and familiarity with Tyner’s comping and solo style. I especially liked his playing on a blues segment later in the piece. Interestingly, Wayne sits out a good bit in this performance, as did Jonathon playing the Jimmy Garrison bass role. There were several passages with drums and sax, and of course the masterful drum solo intro to Pursuance. Mark played these and more with real skill: powerful and clean, but also gentle and reflective at times. I couldn’t see the players from where I sat, and was left wondering how he performed some passages. I remember one spot with kick drum and toms (and perhaps snare with the snare off?) accompanied with cymbal washes that left me a dumbfounded. Now how did he do that? Last time I talked to him he only had two arms and two legs. Jonathan had problems with his sound in this painted, brick-walled space, but played with great enjoyment (his face is often smiling and engaging) and real capability. There are several passages in Love Supreme where we hear solo bass, and these were a pleasure: the mantra that introduces and farewells the first track, Acknowledgement, and the bass solo featuring chords and a fascinating falling 16th note triplet feel preceding Resolution. Otherwise, the band played a short first set of three tunes: Invitation, In a sentimental mood, and Take the Coltrane. Then Love supreme as the second set, with a swinging, fairly relaxed version of Coltrane’s signature piece, Giant steps, as an encore. It was another night of soaring, emotive early 60’s jazz from John and crew, and much enjoyed. ArtSound was recording, so keep an ear open for the broadcast. John Mackey (tenor sax), Wayne Kelly (piano), Jonathan Zwartz (bass), Mark Sutton (drums).